Best book to learn C? If you could recommend one book to a total beginner who wants to learn how to program in C, what would it be? It shouldn’t be microcontroller-specific (more general is better), but it does need to make sense to someone with zero programming experience (in any language). 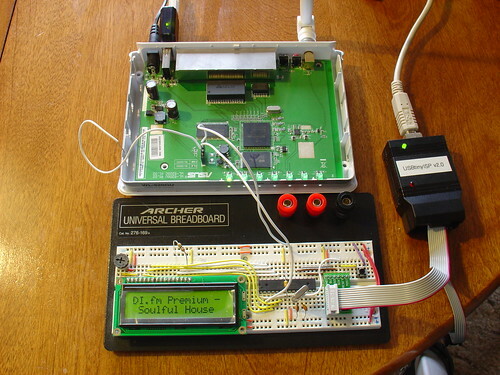 This is the eighth part of an ongoing series about building a low cost, open source streaming internet radio based on the ASUS WL-520gU Wireless Router . If you haven’t already, check out the previous parts (see the links at the end of this article) for some background about the project. In part seven, we added an LCD status display for the radio that shows the stream name as well as the artist and title of the current track. In this part, we’ll add a tuning knob that lets us change stations without using a computer. It turns out that this is mostly a software exercise, made simple by taking advantage of the analog to digital converter function of the Atmel ATmega168 AVR that is controlling the LCD display. The addition of the tuner control turns the display circuit into a very simple user interface. Turn the knob and the station changes. The position of the knob determines what station the radio is “tuned” to, and when combined with a calibrated scale it will make it easy to change to any one of the several streaming radio stations stored as presets (favorites?) in the router. To give you an idea of how this works, here is a demo of the tuner control changing between ten preset stations I have set on the router. 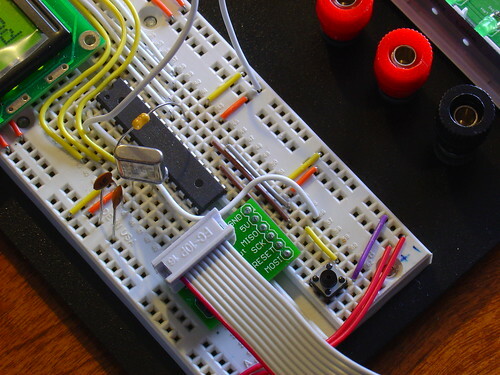 The tuner control is in the upper right hand corner of the breadboard. As I adjust the control, the music changes and LCD display updates to show the name of each new station. If you are interested in adding this functionality to the radio, keep reading and I’ll show you how. Here is an updated schematic of the AVR circuit showing the potentiometer connected to ADC4 (pin 27). The AVR firmware has been significantly expanded, slightly reworked and cleaned up in some areas. New code supporting the analog to digital converter (ADC) which reads the value of a potentiometer connected to ADC4. A new Timer1 overflow interrupt has been added, which occurs roughly every 0.5 seconds. The interrupt service routine (ISR) checks the position of the tuner control, and if it has changed, sends the value to the router. The ISR is towards the top of the file, see the SIGNAL (TIMER1_OVF_vect) section. The ADC range of the ATmega is 0 – 1024 for an input voltage from 0 to 5V. The AVR sends serial data in the format “Tuner: Value” back to the router when the tuner position changes by more than ADC_SENS counts (default is 5). The AVR waits for an “AVR Start!” command from the router before sending any data, this avoids filling up the serial receive buffer on the router before it’s ready to start processing data. An important consequence of this is that the AVR must be reset before running the control script on the router. You can download the source code and compiled .hex file here. Flash it to the AVR using any compatible ISP programmer and you should be good to go. The source is commented fairly well so if you’re interested in learning how the interface works, take a look. You will need a copy of the ATmega168 datasheet to understand the register names and other architecture-specific parts of the code. Feel free to post in the comments with any questions. This part is pretty simple – just wire the potentiometer as shown in the schematic. Most potentiometers have three terminals. The left terminal goes to ground, the right one to +5V, and the middle terminal to ADC4 on the AVR (pin 27). To make bidirectional communication with the AVR work, we have to change a couple config files on the router and disable some services that would otherwise get in the way. The first change is to modify the /etc/config/network file so that we can always telnet or ssh into the router on a LAN port using the IP 192.168.1.1. The ability to access the router via ethernet is helpful in case we screw something up and lose the wireless connection or the router loses it’s IP address, etc. Save changes, restart the router, and connect an ethernet crossover cable (straight cable might work on some computers) to the router. Configure your desktop/laptop computer with a static IP, like 192.168.1.185. Try to open a telnet connection (or ssh if you have set a password on the router) and see if you can log in. If not, don’t continue with the next steps until you can get this working. We previously used the router’s serial port to get a login shell. Now that we’re trying to receive data from the AVR on the same serial port, we need to disable the login shell or it will capture the data before we can get to it. Reboot the router to apply the changes. Now we can get on with the good stuff! The real action happens on the router, where a shell script waits for input from the router and changes the station accordingly. The interface script adds ten presets to the router, shows the playlist, and then waits for valid tuner data from the AVR. Once it receives a “Tuner: value” line (which should occur shortly after the AVR receives a go signal from the script), the script prints the received tuner positon and changes to the requested station. It will then wait for new tuner data from the AVR and change the station when necessary. As you can see in the video, this works very well. Over a fast Wi-Fi connection, the time to change stations is almost instantaneous – very satisfying! That’s it for part eight. In part nine, I’ll add some finishing touches to the router configuration and start talking about enclosures. Stay tuned! Update 2: Part nine is now available. This is the seventh part of an ongoing series about building a low cost, open source streaming internet radio. If you haven’t already, check out the previous parts (see the links at the end of this article) for some background about the project. In part six, we used OpenWrt’s UNIX-style shell commands to interface with mpd, the music player daemon, and redirect song and stream information to our ASUS WL-520gU wireless router’s serial port. In this part, we’ll use a Sparkfun 16×2 LCD display and a handful of other components to build an LCD status display for the radio. After much thought, I decided to use an Atmel ATmega168 AVR microcontroller to drive the display. I realize that this raises the technical level of this project significantly, but I have been wanting to feature an AVR project on the site and this is a great opportunity. The truth is that an Arduino would work just as well and it shouldn’t be too difficult to port this program to an Arduino sketch. (The Arduino is built with the same ATmega168 microcontroller, after all.) If anyone does this, let me know and I’ll post a link to your version of the display. If you’re an AVR veteran, you can skip over this part and straight to the bill of materials below. If you are new to the AVR, don’t be intimidated. 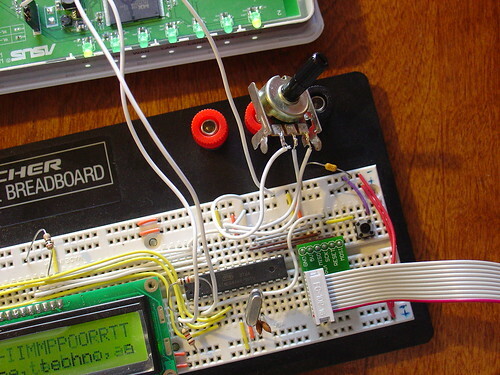 There are a number of tutorials online to help you learn how to use this inexpensive and powerful microcontroller. I recommend starting with this one or maybe this one, but see my note about AVR MacPack below if you’re using a Mac. If you’ve never programmed in C before, you’ll have an additional hurdle to get over, although for this project you won’t need any actual knowledge of programming or C to burn the code to the AVR and get things working. I recommend following a tutorial or two and getting a simple blinking LED example working on your AVR before building the LCD display. That way you can be sure your programmer, development environment, breadboard, etc are working first. a solderless breadboard, like this one (comes with precut wires!) or this one. a 4-pin female 0.1″ header, this breakaway header is handy. You can download the source code and compiled .hex file here. Special thanks to Peter Fleury for his excellent LCD library, which saved me from reinventing the wheel! 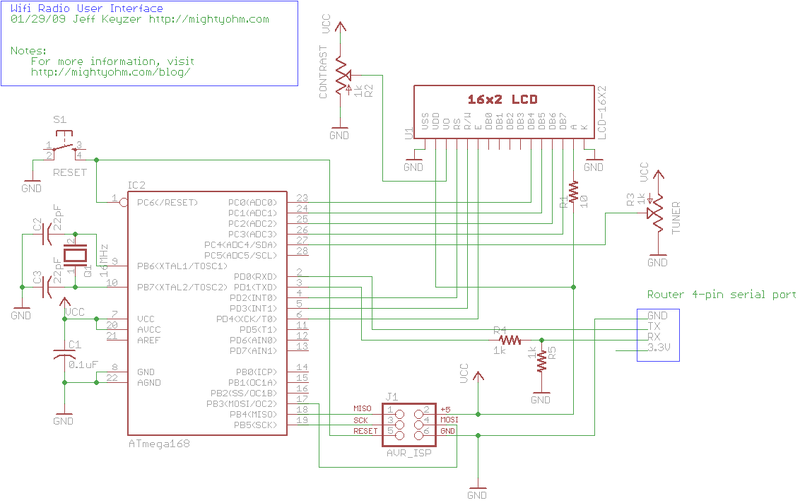 He also has another page about interfacing LCD displays to an AVR. Assembling the circuit on the breadboard is pretty straightforward. Here’s a photo showing all components of the setup. The router is shown above with the serial port wired to the breadboard (the RX line is floating as we’re not using it yet). The USB AVR programmer is on the right, where it is also functioning as a 5V power supply for the circuit. Make sure the 2-pin jumper on the USBTinyISP is installed, this enables the +5V supply. 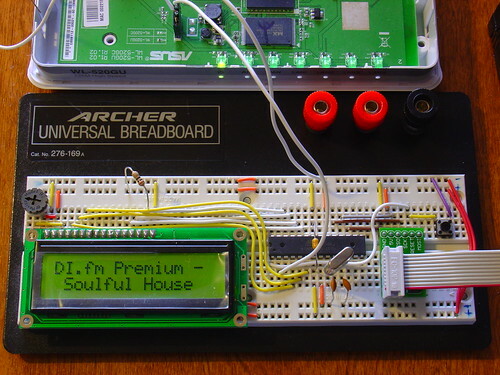 The LCD is shown displaying the current stream name (DI.fm). Here is a closeup of the components installed on the breadboard to show how I did things, feel free to experiment with the placement of components. As long as you follow the schematic the circuit should still work. 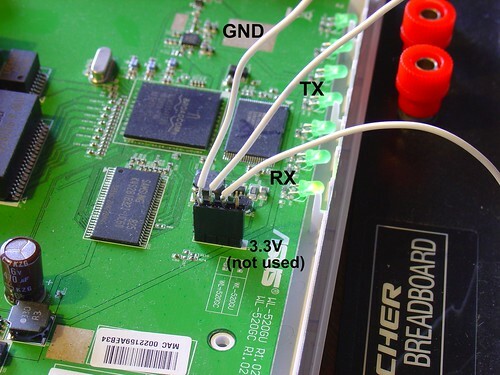 Here is a closeup of the serial port connection to the router, including the 4-pin female 0.1″ header. I soldered wires to the pins of the female header (not the pins on the board). 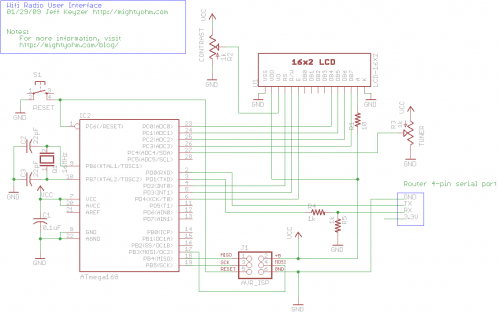 Once the circuit is assembled on the breadboard, we need to flash the AVR microcontroller with the main.hex file included with the firmware above. If you’re using AVR MacPack and OS X, this should be easy (since that’s what I’m using). PC guys will need to figure this out for themselves but hopefully the process is similar (please let me know if the Makefile works). Connect the USBTinyISP to your computer with the USB cable and to the breadboard with the ISP cable. The green light on the programmer should be on, indicating it is ready, and the backlight of the LCD should be lit, indicating that the breadboard is getting power. If everything went well, the LCD display firmware is now loaded into the ATmega168 and the circuit is ready to go. If not, double check your connections and take a look at the help! page for the USBTinyISP. Telnet or ssh into the router. Start mpd and connect to a stream using mpc (we covered this in part five). Once the stream starts playing, execute the display.sh script we created in part six. Within a few seconds, if everything is working, you should see the stream name on the display, followed by the artist and name of the current song. Congratulations! That’s it for part seven! In part eight, we’ll start working on the input side of the user interface. Like what you’re seeing? Have suggestions about what could be improved? Leave a comment or contact me directly. Update: Part eight, in which I add a tuning control to the radio, is now available.